As a first time mum, planning the nursery where your baby will (hopefully) sleep and where you’ll share beautiful bonding feeding moments in the middle of the night is pretty special. Pinterest, Instagram and any ‘nursery’ google search will land you in a world of rich cottons and delicate wall mounts, plush feeding chairs with matching ottomans and gorgeous wicker bassinets. And while the idea of having the absolute best for your baby and creating an ‘inspirational’ play space can be exhilarating, the costs involved can put a damper on it. Of course they don’t have to, and having children will certainly teach you to be thrifty if nothing else! We have compiled a list of practical objects that each nursery needs to be functional, while giving you some options on how to keep the costs from mounting! 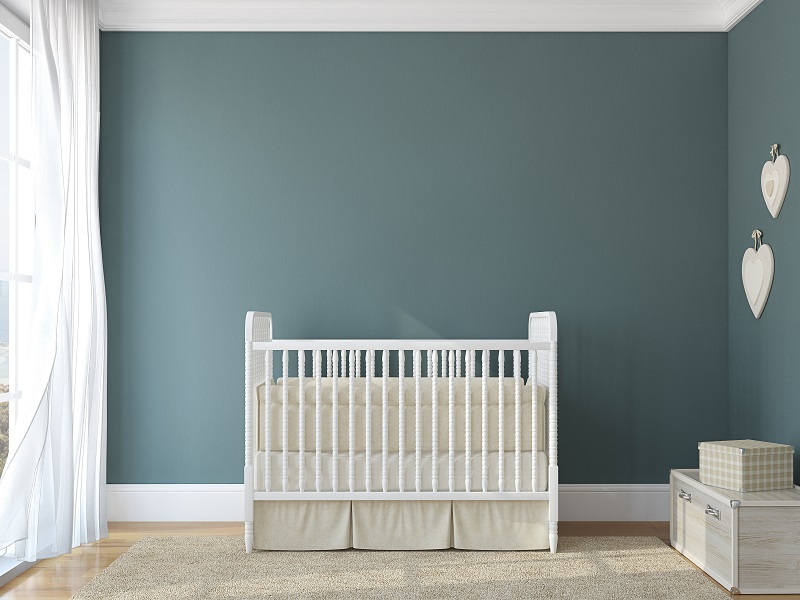 The first object you’ll probably buy for a nursery is the place your baby is going to sleep. The most cost effective way to do this, is to buy something that grows with the baby. Even if you want to start with a separate bassinet and then move to a cot that can convert to a toddler bed such as our Amiel and Cambria cots, you’re eliminating the need for 3 different purchases with only the two (and the cots do suit newborn if you opted to skip the bassinet stage). These cots accommodate a baby up until they’re 23kgs which even with the most food happy baby will take them well into their toddler years! Our Coco bassinets combine the timeless beauty and breathtaking looks that you might see on a bassinet with a hefty price tag, but are designed to be a suitable choice for every budget conscious family. They’re versatile and lightweight (easy to move from room to room so your baby can sleep anywhere), are made from a breathable mesh fabric and feature a gorgeous wooden cross over base made from good quality New Zealand Pine, with a decorative canopy and mattress. There are some incredible companies around these days who specialise in wall decals and stickers. These are the perfect way to personalise your nursery, without the need for anything permanent which is more costly, and will of course take more time to install/paint/remove. You could opt for small stickers of a certain shape, for example triangle, to create a repetitive feature wall over a splash of colour, or choose some larger graphics that really allow you to shine like your favourite characters, Australian native animals or a coloured theme. Op shops are also a really great place to buy objects and give them new life, if being crafty and creative is your thing! An old rocking chair that needs a sand, some vintage curtains or even some decorative toys to give the room a really classic feel will always jazz it up. A change table needs to be a great investment, because even in the toilet training years you will be using this more often than their bed. It needs to be a great height, have adequate storage, be sturdy, be safe and really it needs to look pretty too. The Combo Change Table ticks the boxes in all of this categories with its 3 tiered sturdy base on wheels with a gloss finish! Huzzah! By having 3 tiers you have enough storage for nappies, wipes, bedding, creams, and everything else you need at hand when you simply, don’t have enough hands. A good solid change table should last you through each child, and is the one item you shouldn’t have to replace or buy another one of. The feeding chair is probably something to splurge on - because you’re going to spend an awful lot of time here in the middle of the night! That’s not to say there isn’t a lot of budget choices available, and hand me downs can be a life saver. The best thing you can do is work off reviews, and try them out yourself. Get a great cushion to support your back, a feeding cushion to support bubs and a warm and cozy knit to throw around your shoulders to keep warm. If you don’t have carpet, a large rug is a fabulous choice again for those colder months. It will also help mask the sound of you escaping back to bed once you’ve finally settled your little one! Stay ahead of the trends and market and follow mums in the know. There are some excellent gadgets available to mums these days to help you see baby from your room, monitor their breathing and oxygen rates, play them a lullaby from the cosiness of your own bed 2 rooms away and so on. Do your research and make sure you’re buying something that’s tried and tested, is rated highly for safety and has a lot of honest parent reviews. Make your life simpler, while keeping your costs down - the perfect parent solution! How to choose a car seat that works for you?